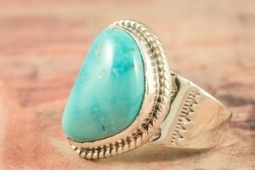 Genuine Castle Dome Turquoise set in Sterling Silver Ring. Created by Navajo Artist Tony Garcia. Signed by the artist. The Castle Dome Turquoise Mine is located about 30 miles from the Sleeping Beauty Mine, near Globe, Arizona. The Castle Dome Mine has not been in operation since the early 1970s.